Home / barbecue / pansit sa bilao / party menu / potluck / reyes barbecue / Gotta Try that Reyes Barbecue Potluck Party Treats! Gotta Try that Reyes Barbecue Potluck Party Treats! Having party can make you whole life go crazy. You need to check the invitations, guests, venue, schedules, decorations and the most important - FOOD! That's why it's somehow good to know that Reyes Barbecue came up with this great idea to help out people like me who are so poor in organizing parteeh! 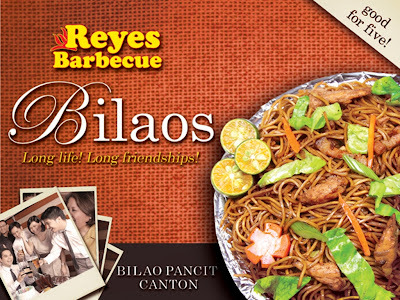 Let me present to you Reyes Barbecue's Bilaos! Yep, our favorite local dishes are up for grabs from our favourite barbecue joint! Enjoy their take on Pansit Canton, Garlic Sotanghon and Spaghetti, which are available in orders for 4 to 6 people. A satisfying party menu for a group of 10 also is available, consisting of 5 one-pc Pork Barbecue Meals, 5 Boneless Chicken Barbecue meals, 2 Bilao Noodles, 2 pitchers of Nestea and 2 packs of Choco Merengue for dessert. Yummy, right? And as for the price, all for less than Php2,000.00! Another party menu option is an all-seafood barbecue party for 10. And for almost Php2,500, you can have 5 Grilled Bangus Belly Meals, 3 Grilled Pusit Meals, 2 Grilled Tuna Meals, 2 Bilao Noodles, 2 pitchers of Nestea, and 2 packs of Choco Merengue for dessert! Not bad, eh? Now, with these party menu available, those simple and yet yummy celebrations are order away!